Drawing on her own groundbreaking research with thousands of men and women, research psychologist and University of California professor of psychology Sonja Lyubomirsky has pioneered a detailed yet easy-to-follow plan to increase happiness in our day-to-day lives-in the short term and over the long term. The How of Happiness is a different kind of happiness book, one that offers a comprehensive guide to understanding what happiness is, and isn’t, and what can be done to bring us all closer to the happy life we envision for ourselves. Using more than a dozen uniquely formulated happiness-increasing strategies, The How of Happiness offers a new and potentially life-changing way to understand our innate potential for joy and happiness as well as our ability to sustain it in our lives. 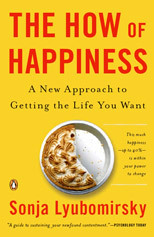 Beginning with a short diagnostic quiz that helps you to first quantify and then to understand what she describes as your “happiness set point,” Lyubomirsky reveals that this set point determines just 50 percent of happiness while a mere 10 percent can be attributed to differences in life circumstances or situations. This leaves a startling, and startlingly underdeveloped, 40 percent of our capacity for happiness within our power to change. Lyubomirsky’s “happiness strategies introduce you to the concept of intentional activities, mindful actions that you can use to achieve a happier life. These include exercises in practicing optimism when imagining the future, instruction in how best to savor life’s pleasures in the here and now, and a thoroughgoing explanation of the importance of staying active to being happy. Helping you find the right fit between the goals you set and the activities she suggests, Lyubomirsky also helps you understand the many obstacles to happiness as well as how to harness individual strengths to overcome them. Always emphasizing how much of our happiness is within our control, Lyubomirsky addresses the “scientific how” of her happiness research, demystifying the many myths that unnecessarily complicate its pursuit. Unlike those of many self-help books, all her recommendations are supported by scientific research. The How of Happiness is both a powerful contribution to the field of positive psychology and a gift to all those who have questioned their own well-being and sought to take their happiness into their own hands.